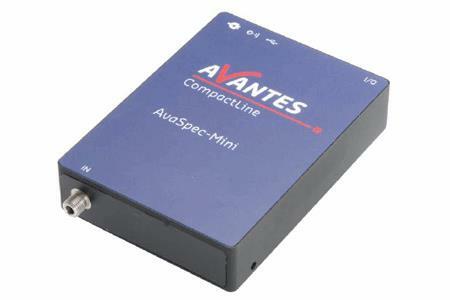 The AvaSpec Mini is a powerful spectrometer in a small package (90 x 68 x 20 mm, 155 grams). The instrument is available in a variety of fixed configurations covering the UV to the NIR with resolution as high as 0.2 nm (FWHM). This spectrometer is ideal for radiometry, UV/VIS chemistry, colorimetry and Raman spectroscopy applications. The AvaSpec Mini is available individually for lab use or for integration into other devices as an OEM-spectrometer. The AvaSpec Mini miniature spectrometer is no larger than the size of a deck of cards and covers the 220-400 nm (UV), 350-880 nm (VIS), and 750-940 nm (NIR) wavelength ranges. It offers 0.2 nm (UV), 0.5 nm (VIS), and 0.3 nm (NIR) resolution, <0.17% stray-light, a 350:1 signal/noise ratio, a 100μs – 10 minute integration time, 4 configuration I/O channels, and much more.